We thank you for the gift of your great teaching. Guruji Bellur Krishnamachar Sundararaja (BKS) Iyengar’s style of teaching yoga is internationally respected for its vigour and sophisticated understanding of physical and mental movement, balancing strength, flexibility and endurance. Self-awareness and integration of body, mind and soul are nurtured through Guruji’s precise and subtle teaching of the eight-limbs of astanga yoga outlined in Patanjali’s Yoga Sutras. Guruji’s method is safe when practised progressively; the postures are adjusted to meet the conditions and needs of each student. It is a comprehensive system of self-care that can provide an engaging practice for a lifetime. Dedicated students enjoy an enhanced sense of well-being and relaxation, serenity and improved health. 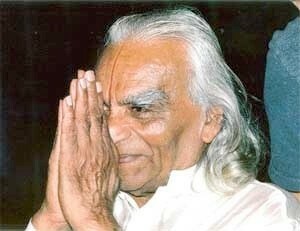 B.K.S Iyengar’s main teachings can be found in his numerous books including Light on Yoga, Light on Pranayama, Light on the Yoga Sutras of Patanjali and Light on Life. The Iyengar Certification Mark is an international symbol of the highest standard of training and continuing education in the Iyengar method of yoga. The mark allows the community at large to identify who are “bona fide” Iyengar yoga teachers and the IYA(UK) is responsible for the administration of the Certification Mark in Britain. It establishes the teacher’s authenticity and dedication to the Iyengar method and is a way for Guruji’s teachers throughout the world to acknowledge him and his work.